New Jersey travel: Great Places in South Jersey! 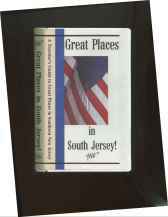 Travel & tourist "things to see" info for the area bounded by Philadelphia, Atlantic City and Cape May, New Jersey. Buy the "Great Places in South Jersey" Video and see all of the following places from the comfort of your home! With the Great Places travel video, preview all the above attractions before you get here! © 1998-2002 Clay Mikolasy, Producer of "Great Places in South Jersey"